As foodies who love summer, we think the best way to celebrate the warm, fun season is by dining alfresco. Those of us without balconies or large outdoor spaces at home, though, can at least achieve a similar festive vibe by making recipes that are seasonally on point. And what evokes summery soirées and cookouts more than a fresh, flavorful seafood dish? 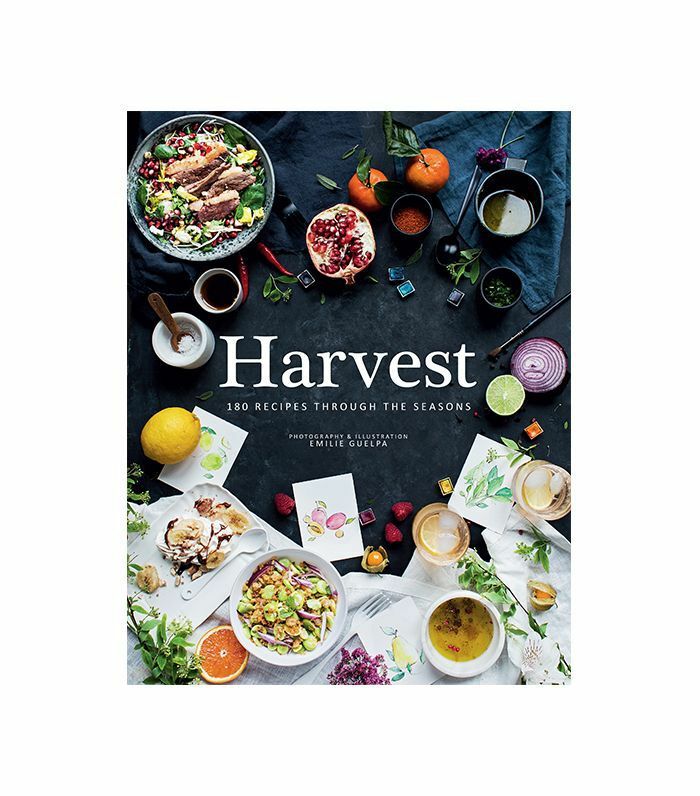 On the lookout for interesting but easy seafood recipes that call for fresh ingredients, we turned to Harvest, a cookbook that offers over 180 recipes to make each season. Curated and illustrated by Emilie Guelpa, this cookbook beautifully guides us through the most delicious and healthy recipes to enjoy each season, making meal planning, grocery shopping, and cooking a lot easier and tastier. Whether you decide to cook just for yourself, want to plan a romantic meal for two, or host a bunch of friends on the outdoor patio, these three easy seafood recipes guarantee top-notch summer eating. From a light but filling spaghetti alle vongole to spicy king prawns and seared tuna with fennel confit, let's just say you won't need to go fishing for compliments with these dishes. Scroll through for the detailed recipes below, and don't forget to shop the cookbook at the end to start planning your fall menus. Make the most of the summer’s mangoes and whip up a delightfully sweet and spicy salsa to complement this refreshing and nutritious combination of barbecued king prawns with rice noodle salad. To prepare the salsa, peel the mango, remove the flesh from the stone, and dice finely. Transfer to a bowl and combine with the lime juice, onion, chili, and Vietnamese mint. Season to taste with freshly ground black pepper and the fish sauce. To butterfly the prawns, use a sharp knife to slice between the legs from head to tail, taking care not to cut all the way through. Open up the abdomen of one of the prawns and press flat, then discard the intestinal tract and set aside. Repeat with the remaining prawns. Heat a barbecue grill or chargrill pan until hot. Brush the prawns with oil and cook on the barbecue for 2 minutes on each side, then remove. Place 4 prawns and a spoonful of mango salsa on individual plates. Serve with lime wedges. Fennel confit has such a lovely rich flavor and beautiful texture, ideally suited to the magnificent tuna fish. You have to cook the fennel long and slow to get the desired texture. To make the fennel confit, preheat the oven to 150°F. Place the fennel in a baking dish or tin so that the fennel fits snugly. Add the lemon zest, garlic, and herbs to the fennel and enough olive oil to cover. Cover with foil and cook for 2 to 3 hours, until tender. Allow to cool, then remove the fennel from the oil and refrigerate until needed. Lightly toss the preserved lemon, olives, and parsley together in a bowl. Halve and core the fennel bulbs, and add to the bowl. Heat a barbecue grill or chargrill pan until hot. Season the tuna steaks with salt and freshly ground black pepper, and drizzle with olive oil. Rub the oil and seasoning into the fish. Cook the tuna for 1 to 2 minutes on each side, until it is just seared. Remove and place on individual serving plates. Top each tuna steak with 2 fennel halves and some of the preserved lemon mixture. Drizzle with extra-virgin olive oil, season with freshly ground black pepper, and serve immediately. A steaming bowl of mussels makes a great start to any meal; it’s also a dish that takes only a few minutes to prepare. Remember to purchase mussels with their shells closed, and discard any that fail to open during cooking. You can serve the mussels in individual portions, but it’s more fun to throw them in a big bowl and invite everyone to dive in and share. Bring a large saucepan of water to the boil over high heat. Add a good pinch of salt. Add the linguine and stir until the water has returned to the boil. Reduce the heat, cover, and cook the pasta at a fast simmer for 8 minutes. While the pasta is cooking, heat a wok or large frying pan over high heat. Add a swirl of oil, then the garlic. Stir for 1 minute, or until fragrant. Add the verjuice and saffron. Allow the liquid to come to the boil, then toss in the mussels. Cover with a lid and steam for 3 to 4 minutes. Have a large bowl to hand. Remove the lid from the wok, shake the wok well, and remove the cooked mussels as they open, placing them directly in the bowl. Check the pasta is cooked, then drain. Remove the pan from the heat and discard any mussels that didn’t open during cooking. Add the parsley and butter to the cooking liquid and whisk through. Check seasoning and add salt and freshly ground black pepper if needed. Pour the cooking juices over the mussels, add the pasta, and toss to combine. Serve immediately. Let us know which dish you like best in the comments below, and then shop the cookbook for more summer recipe ideas or get a jump start planning your fall menu. Recipes excerpted with permission from curated and illustrated by Emilie Guelpa, published by Hardie Grant Books March 2017.